The Hermit tarot illustrates an interesting paradox on the spiritual journey. While the Hermit’s spiritual progress may have isolated him from others, he hasn’t turned his back on them. The Hermit’s staff represents the completed journey and the journey still ahead. Joining the highest peak of human experience with the heavens above it suggests that, from here on, the path is purely spiritual. Yes, the Hermit’s grey cloak shows that his travels have set him apart from the rest of the world. But the Hermit hasn’t left it behind completely. Note that on the Hermit tarot his hands and face are flesh colored. There is still a living, human being inside. The Hermit’s white beard shows that his power is spiritual. The staff and the light inside the lantern of the Hermit tarot card are yellow, symbolizing intellect. This means that the Hermit can communicate spiritual concepts clearly enough so that the rational mind can understand them. At the threshold between human experience and pure spirituality, the Hermit is lighting the path for others. 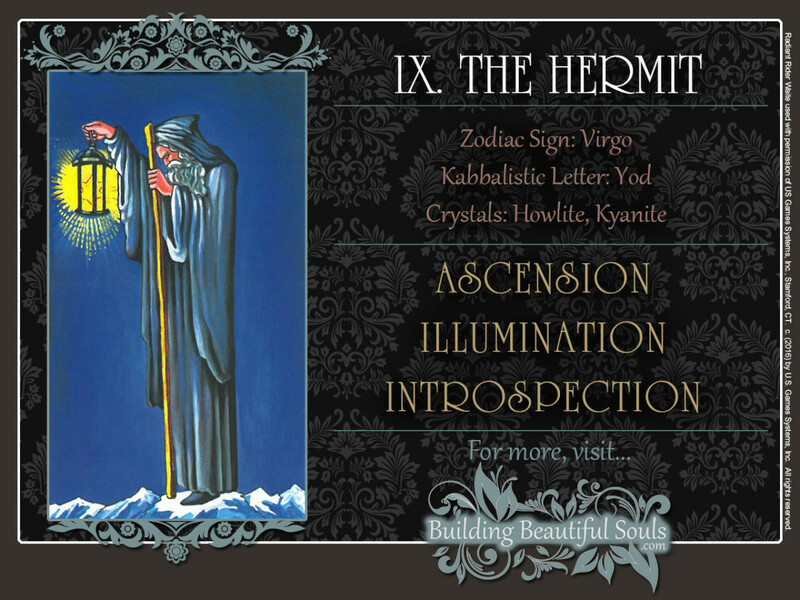 Looking onto the world below, the Hermit tarot card’s lantern lights the way for seekers on the spiritual path. The Star of David inside illustrates the principle of “as above, so below.” It also symbolizes the merging of the material and spiritual world. Concealing nothing, the Hermit card’s spiritual gifts are available to anyone who’s willing to make the journey. And there is the rub. The Hermit will gladly point you in the right direction, but he can’t carry you up the mountain. The Hermit tarot card symbolizes mastery in the truest sense. The task of the master is twofold. As the Hermit continues to hone his craft, he also helps others with their progress. A master is a teacher, and while a teacher guides his students along the path, he must always be one step ahead of them. Otherwise, they would be stumbling in the dark. It goes without saying that this role isolates The Hermit from those around him. While this card primarily speaks of spiritual development, its meaning can be applied to everyday life. You have reached a stage in your spiritual progress where your experiences and learning can offer you nothing new. How many books have you read? How many spiritual traditions have you explored? It feels that you are reading the same book over and over again and that all traditions are pointing in the same general direction. This means you are ready for the universe to let you know that you haven’t seen anything yet. As new revelations gradually prepare you for the next step, other people are seeking you out. However, while you can show them the way, you cannot make this journey for them. After all, spiritual enlightenment is not an easy path and getting from point A to point Z can only be achieved by putting one of our own feet in front of the other. Going as deeply within as you are going right now means that you are learning detachment. From the outside, your position looks like a lonely one, but solitude and loneliness are not the same thing. Remember that without your guidance, the night sky and the world below would be darker by one brilliant light: yours. The Hermit tarot is associated with the Zodiac Sign of Virgo, the eternal maiden who must maintain her purity in order to give life to others. Once you begin to ascend, to awaken, those relationships and situations which no longer match your vibration begin to melt away. It is a natural part of the spiritual evolutionary process. When reversed, The Hermit tarot card can indicate a sense of jadedness, isolation and self-absorption. Taking stock of your experiences, ordeals, and accomplishments, you may wonder if it was really worth it or if you are on the right path. As new insights flood your consciousness, you find yourself revising long held, cherished beliefs and pet theories. You may even discard some of them. In light of these new insights, you wonder whether or not you deserve the admiration others have showered you with. Perhaps you worry that you have misspent your life or worse, misled others. But replacing outmoded ideas with newer, better ones is a sign of continuing growth, not past deceitfulness. 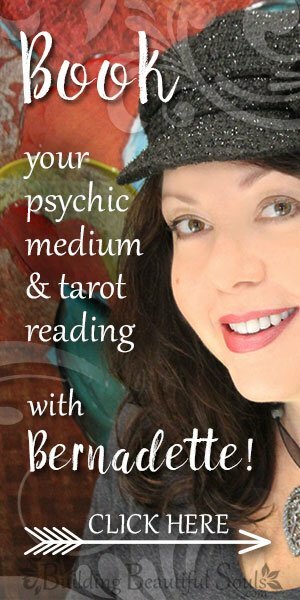 If the Hermit tarot is inverted in a reading, it can be helpful to ask yourself how much truth there is to your doubts. None? Some? Honesty is required to get to the truth. Sometimes this means looking within for the answers, but sometimes the answers are found outside yourself. How much time exactly are you spending inside your head? If you are beginning to feel like a fish out of water, it may well be that your self-imposed exile is getting to you. The outdoors is only a few steps away, and you only have to pick up that phone to speak to a faraway friend or relative. It’s not as heavy as it looks. Additionally, when the Hermit card presents himself to you, it could very well be a divine message letting you know that humans aren’t as bad as they might seem and connection to them is important at this time. The Hermit tarot card is the ninth Major Arcanum, the number of months in the human gestation cycle. But here, the birth in process here is spiritual, rather than physical. Read the in-depth description of the Numerology meanings of Number 9.